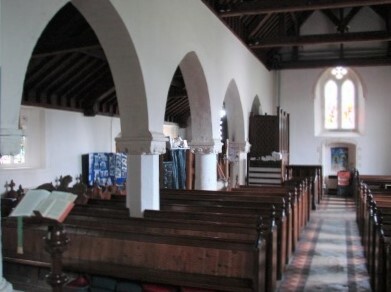 The nave is C11, with a late C12 south aisle and a slightly later south chapel. The chancel and north tower are C13 and there are good monuments, especially two related C16 ones. The church stands in what remains of the old village, with houses that have been carefully and perhaps excessively restored. Herringbone in the north wall of the nave shows it is C11 and the thicker lower part of the west wall is probably also of this date. 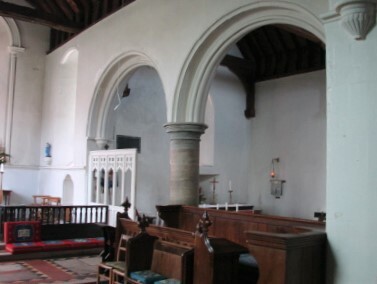 In the late C12 a south aisle was added, with a four-bay arcade, which has plain, pointed heads and alternating round and octagonal piers on high, spurred bases. Each square capital has inexpertly carved foliage, ending in a kind of volute at each corner. Quartermain shows the aisle had lancets ((W) p276), but only a pointed doorway survives; there is also a restored chamfered north one with abaci. The gabled south chapel dates from c1200, as the two-bay arcade to the chancel shows, and is wider than the aisle. The moulded arches of the arcade are close to contemporary work at Boxgrove and Chichester cathedral which is unsurprising since West Wittering was an episcopal manor (VCH 4 p218). The round heads may seem surprising at this date, but there are comparable ones at Chichester and Boxgrove and they are a reminder that the emergence of the pointed arch at the expense of the round head was a gradual process. The round marble pier is a further link, though the square responds, with concave fluted corbels for the inner orders of the heads, are less so. This arcade confirms there was a chancel before the present later C13 one, which has low clasping east buttresses and, for the most part, lancets. The east pair and the north east one date from 1845, but are said to have been based on good evidence (2 p13), including the shafted rere-arches. The square responds of the chancel arch are chamfered with stops and the inner order of the head rests on convex fluted corbels. The two lights of the north west window have shouldered heads, more common in secular architecture but original, and a further window to the east is raised above a roll-moulded doorway with a depressed head. The tower at the north east corner of the nave is also of this date and its clasping buttresses are related to the chancel. It is no higher than the roof, despite having two stages. The base has lancets and an arch to the nave, plain except for a single chamfer. A small blocked, pointed recess in the east wall inside suggests the presence of an altar (2 p21). The bell-openings have been altered from the square-headed ones shown by Adelaide Tracy (I p1) (1852). These could have been C15, but were more likely post-Reformation. 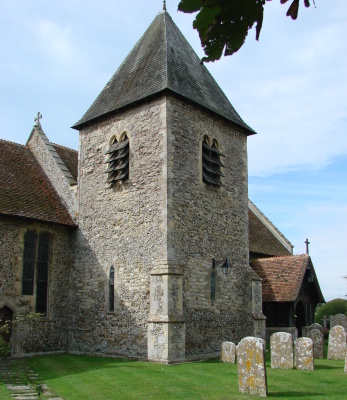 The shingled pyramid spire is unchanged and the timber bell-frame with four large corner posts and heavy diagonal braces, rising from the ground, may be C13 (ibid p22). A round stair to the bell chamber is probably C16. Most other later mediaeval or later alterations have gone. Of indeterminate date were the east window before 1845, which had three small round-headed lights in a row (Quartermain (W) p275), and also the east window of the south chapel. This was larger than the present lancet, as its sill, still visible, shows. A worn moulded west doorway is C15, along with large west buttresses and a few timbers in the north porch. Quartermain’s second drawing (undated, but before 1875) ((W) p276) shows that most windows in the nave and south aisle were C18 – the big west one had a wooden mullion and transom. The chancel was restored in 1845 by an unknown architect. W White restored the rest between 1873 and 1875 (BN 29 p185) at a cost of £1498 (KD 1899). The discovery then of a C13 coffin lid under the chancel floor (see below) shows White also worked on the chancel, which would be unsurprising 30 years after the first restoration at a relatively early date. He refaced almost all the exterior, replaced most windows and rebuilt the south aisle, west gable and the nave and aisle roofs. On the tower, he replaced the bell-openings. The chapel in particular retains little of its previous appearance and the arch to the south aisle is entirely his work. 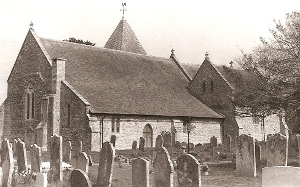 Until 1875 the chancel roof was higher than the nave (Peat and Halsted p178), but White then made it lower, re-using some existing timbers. Altar rails: Soon after 1600 at the latest and thus a rarity.The solid lower part is carved with shallow patterns, beneath turned balusters in the upper part. Benches: (Chancel and nave) Some ends have C15 or C16 poppy-heads. The modern pews are copied from them. The choir stalls include one misericord with a bishop’s head, which is perhaps C15. 1. (West respond of south chancel arcade) Stone with a cross on each side, found in 1875 (1 p276). This has been dated to the C10 or C11 (Tweddle (ed) p186) and may have been a gable-cross from an earlier church. 2. (South chapel) C13 marble coffin lid with a cross and crozier. This was found in 1875 under the floor in front of the altar (Watney p74). 3. 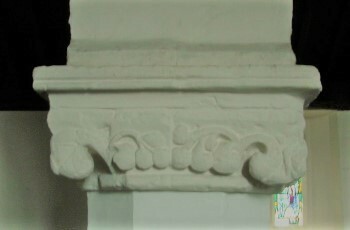 (Above chancel arch) Two reset carved heads of uncertain date and provenance. Font: Plain tub, probably C11. The base is assembled from several blocks of stone. Font cover: Conical. W White, 1875 (Hunter p299). 1. (East window) Mayer and Co, 1890 and strikingly pictorial for the date (signed). 2. (North chancel, third window) Cox Sons and Buckley, 1899 (signed). 3. (West window) J Hardman and Co, 1901 (Index). 4. (South aisle, first window) A K Nicholson, two figures, c1918 (WSRO Fac). 1. (North chapel) Crisply carved but anonymous marble slab with an incised crozier. It is similar to three in Chichester cathedral and others nearby. Most of the group has been dated to c1305 (Badham and Norris p142), including this one. On the basis of the lettering at Chichester, all have been assigned to the so-called Ashford workshop, one of the early London workshops. 2. (North chancel) William Ernley(?) (d1545) Two monuments thought to be to the same man. Originally the smaller one was at right-angles (VCH 4 p220). 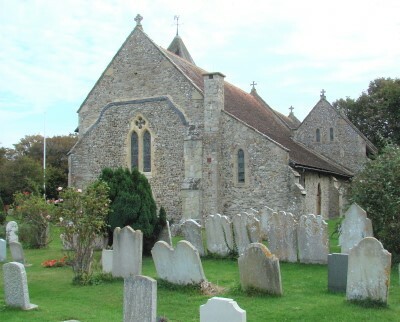 They are the best preserved of the so-called Selsey type of monument. The canopies are similar on both and formerly had decorative cornices. The arches, which frame reliefs above shallow tomb-chests, have depressed, shouldered and moulded heads and carved spandrels. The reason for two monuments is unclear. The larger one may have been in memory of Ernley’s first wife, Elizabeth (d1528) and the smaller one may commemorate him, built by his second wife, Bridget (2 p15). This would explain the more conservative style of the older one. 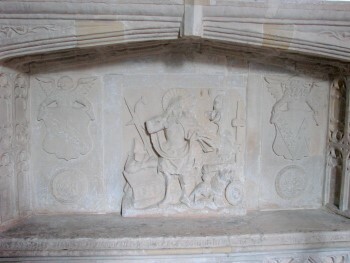 The relief in its centre is a Resurrection, well preserved except for vandalised heads, flanked by angels bearing shields. The front of the chest has shields in cusped lozenges, separated by small saints in niches. The later tomb shows Renaissance influence, especially the front, on which there is an Annunciation. Between the figures is a lily bearing a crucifix (a rare departure from the usual iconography) and the front is treated as an entity with naturalistic features, like the curtain behind the Virgin. The narrow flanking pilasters have cherubs and other Italianate detail. The obvious source is the de la Warr chantry at Boxgrove. 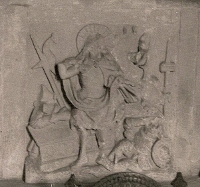 The main relief shows the Risen Christ, flanked by kneeling figures. Shields on the jambs of the lancet above bear the arms of the family. Paintings: Those found in 1875 were said to be too damaged to be preserved (1 p276). Piscina: (South chancel) C13 trefoil-headed and roll-moulded. Pulpit: Wood, with open sides, 1875 by W White (Hunter ibid). 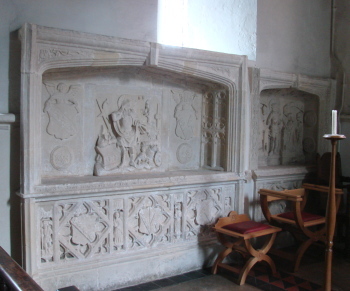 Stalls: (Chancel) Two, which are probably C16. 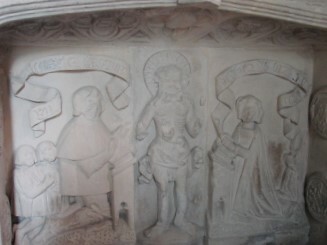 Each has a misericord, with a rose and the head of a bishop. They are incorporated in stalls by White (Hunter ibid).